My August 20, 2015 post about the dedication of the stature of Mother Catherine Spalding at the Cathedral and my connection to the Sisters of Charity of Nazareth triggered quite a few more memories. 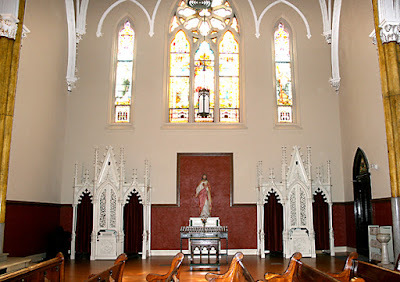 Father Bob Ray and I are from the oldest Catholic parish in Meade County, Kentucky, St. Theresa of Avila. not far from Rhodelia. 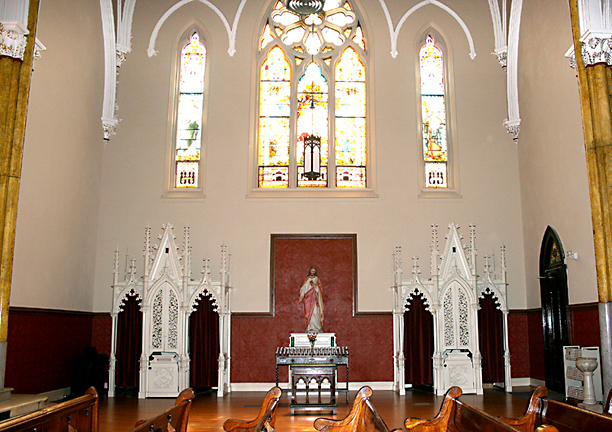 Catholic settlers began arriving in our area in the late 1700's and the parish was officially established in 1818. The first church was a log cabin on the banks of the Ohio River. Moving closer to the present location, a second log cabin church was constructed in 1826. In 1855 building operations began in the present church which was dedicated officially by Bishop Spalding (I was pastor of his home parish from 1980-1983) June 16, 1861. In 1866, St. Theresa Academy was built and opened as a boarding/day school. The Sisters of Loretto were the first teachers, but the Sisters of Charity of Nazareth took over the school in 1870 and the "Sisters' Farm" was purchased. From 1950 - 1952, I attended St. Theresa Academy for my first and second grade (bottom floor, center of picture). It was torn down the summer of 1952. 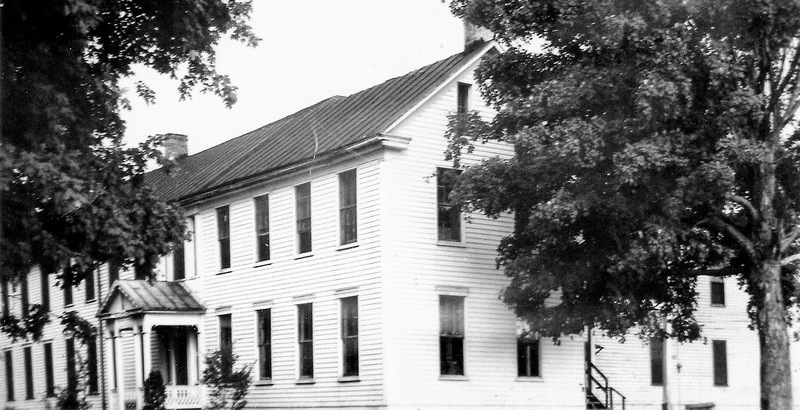 A newer much smaller school opened in the fall of 1952. The Sisters of Charity continued to teach until the close of the school in 1993. I remember going to weekday Mass in the academy chapel (all the way to the end, on the left of the door, on the first floor, in the top picture). I remember spilling a bowl of vegetable soup in the first grade onto Sister Mary Ancilla Meyer's starched bonnet when she bent over to pick up a muffin that had rolled off my cafeteria tray. (The cafeteria was the room to the far right, bottom floor, of the bottom picture.) Her drooping, vegetable covered bonnet caused her to run out of the cafeteria and up to the convent area to retrieve a replacement. I remember the wood stoves we had to heat the classrooms and the outhouses we used for toilets. With no running water, we carried buckets of water into the class room and used dippers to pour water over our hands before lunch. One of the "treats" was to be assigned to sit on the wood box next to the stove and cut paper towels in half to save money. I can remember meeting Mother Bertrand Russell who was visiting the convent one day. The Sisters were so nervous that it was a bit like God herself was coming for a visit. I remember a large jar of Necco wafers on a tall cabinet in the convent area and could not imagine why they didn't eat all of them while they had them. I can remember meeting Sister Mary Ancilla in the Sisters' "parlor" (the room to the left of the door in the top picture) to touch up my second grade, regional award winning, fire prevention poster on a Saturday morning before it was submitted. I was not always a winner, however. Sister Mary Ancilla was in charge of the altar boys. After failing the altar boy test for the third time, she said to me, "Ronnie, you are a good kid, but I don't think you will ever be any good around the altar." We were friends till she died. After the old academy building was torn down, my father bought the "Sisters' Farm" which surrounded the old Academy building. This meant that I was always around Sisters of Charity growing up - not only at school, but though out the rest of the week. I remember some visiting "citified" Sisters and I being chased up a hill by one of my father's bulls while picking blackberries behind the convent on what used to be their farm. I remember the day in 1956 when the crucifixes came down and all religious pictures were removed when we officially became a public school, changing our name to Cross Roads School, even though the Sisters continued to teach all the grades in their habits. The only thing different was we went to the parish hall for religious education. 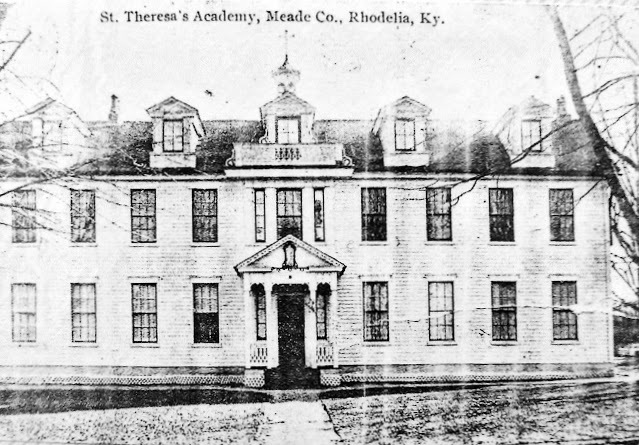 To this day, "St.Theresa School," carved in stone above the entry doors, has never been removed or even covered up. I remember scrubbing the labels out of the new bathtubs when the Sisters moved into their new convent. I remember drinking Cokes in the kitchen on Saturdays as they ran their starched bonnets through a "pleater" - a small wringer-like gadget that made the back of their bonnets into accordian-like pleats. I can remember talking over the fence between the convent and our farm with Sister Agnes Bernard Tholl the day before I left for the seminary in 1958. I loved her very much and she was a wonderful inspiration. I remember her last words to me that day. "Ronnie, you will have a hard time, but I think you will make it!" Sisters David Clare Riesbach, Rose Marie Kirwan and Carol Ann Bonn were all there to make sure I had great music at my first Mass. Finally, there are so many, some dead and many living, that I could never name them all, but to all of them I simply say this, "I thank you and I love you!" A few years ago he helped me transition my book publishing to Create Space, a print-on-demand service. He does the layout now for all of my books and brings my concepts for their covers to reality. He prepares many of my books for eBook editions as well. He pretty much manages my publishing empire! He set up my RonKnottBooks.com website and keeps it running and up-to-date. He was the interior designer on my project at St. Meinrad when we renovated The Commons space and turned it into Jack’s, a coffee and ice cream shop. (See blog post - My Coffee Shops, week of 8/16, 2015.) 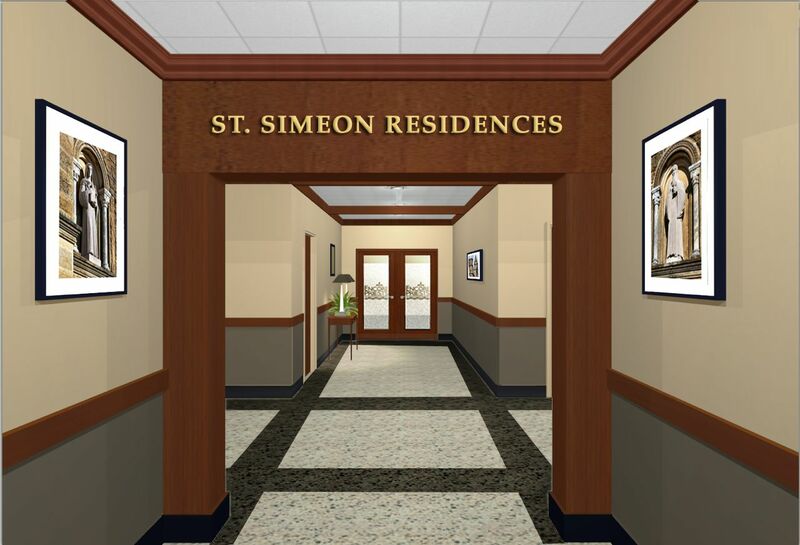 He was also the designer on the renovation of the St. Simeon Residences in Bede Hall at St. Meinrad. (See blog post: St. Simeon Residences, week of 9/6/2015.) He knows how to work within a small budget and find the right thing at the best price. Because of his work on Jack’s, St. Meinrad hired him to help them with the initial space planning and basic design of the entire renovation of Bede Hall and Newman Hall. He has done consulting work for many local churches, most recently the renovation of St. Boniface. He has a degree in Fine Arts/Interior Design from the University of Louisville. 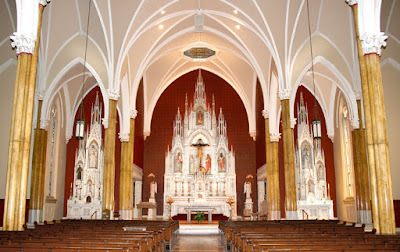 St. Boniface sanctuary before and after. 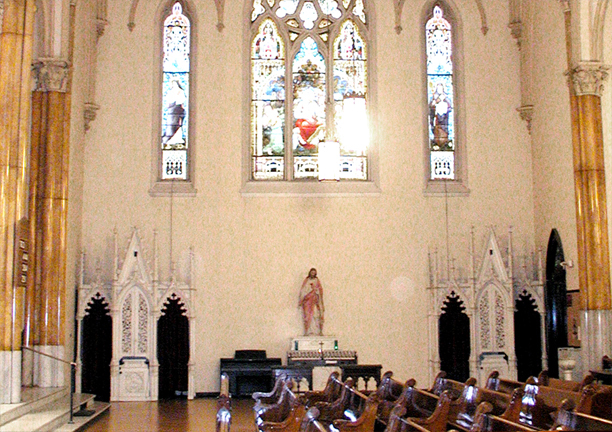 St. Boniface transept before and after. 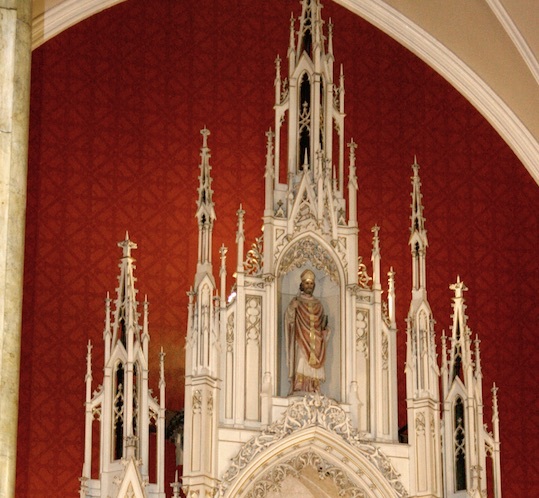 Detail of the subtle two-tone pattern on the red walls. Below: before and after images of Jack's Coffee Shop. He put together all of the power point presentations I use when I travel to give priests retreats and convocations. He creates all kinds of documents for me. He’s a whiz with Photoshop! He designs posters for me. He had large images of fruits and vegetables blown up and framed to hang in the Teaching Kitchen at St. Meinrad. He took photos of various scenes around St. Meinrad, made them look like watercolors and turned them into art for all the rooms and hallways of the St. Simeon Residences and Jacks', the coffee shop. 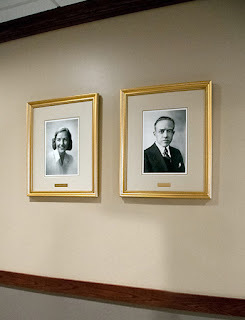 He restored 2 worn and faded photos of the donor and her father and made them suitable for framing. If the name is familiar it might be because you have sung one of his many songs at mass. Yes, he’s a composer, too! If you need advice or professional help on a commercial or residential renovation you should contact him. If you are selling your house he will show you how to stage it and get it sold. Have a yard that needs some landscaping ideas? You should see his yard! Do you need a personal secretary help - he’s the man. If you want to publish a book, set up a website or start a blog and need help - he can do that. Do you need the help of a very creative person who can do just about anything? His fees are very reasonable! My last program to create, before retiring as Director of the Institute for Priests and Presbyterates, was a program to address the fact that 50% of all priests in the United States will be retiring by 2020. This program was envisioned to help retiring priests stay active in ministry by doing things they have always wanted to do, but never got the chance to do them - maybe even doing some things they never imagined doing. I named this program Encore Priests. 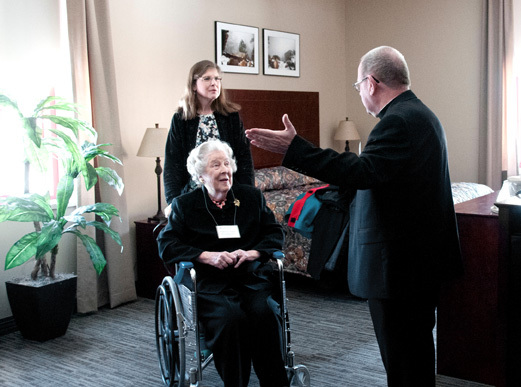 With the help of my good friends, Patricia Tafel Kirchdorfer and my go-to interior designer of choice, Timothy Schoenbachler, spaces were funded and designed to house retired priests who wanted training for new ministries in retirement. 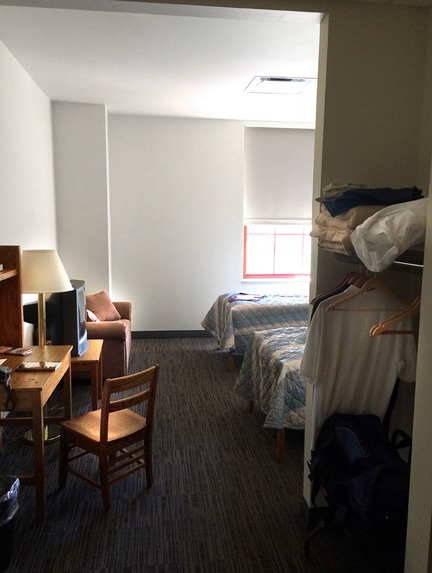 This housing area shares the same floor with the St. John Vianney Life Skills Center and a double classroom. The floor below houses the offices of the Institute for Priests and Presbyterates and a beautiful chapel. St. Simeon Residences is named after St. Simeon the old man who met the child Jesus when he was brought to the Temple by Mary and Joseph. It was a dream of mine to dedicate one floor of guest rooms in the newly rehabbed Bede Hall for use by visiting priests attending Encore Priest and other continuing education programs. For longer-term stay, I wanted them to have accommodations that were comfortable and pleasing - far from what existed. I envisioned rooms and hallways that made them feel like they were staying in a nice hotel with some simple amenities. Thanks to a generous gift by Patricia Kirchdorfer my dream became a reality. She made her gift in memory of her father, Paul Tafel, who was baptised as a convert by his friend Archabbot Ignatius Esser OSB. Bede Hall, coincidently, was the last building constructed while Archabbot Ignatius was abbot. With her gift, Saint Meinrad agreed to let us renovate a floor and dedicate it especially for long-term use by visiting clergy. As in all projects there were limitations - budget, fire codes and various Meinrad restrictions. With the help of Tim Schoenbachler, my go-to interior designer, we were able to create guest rooms and hallways that are a remarkable transformation. The before and after photos below show the dramatic change. 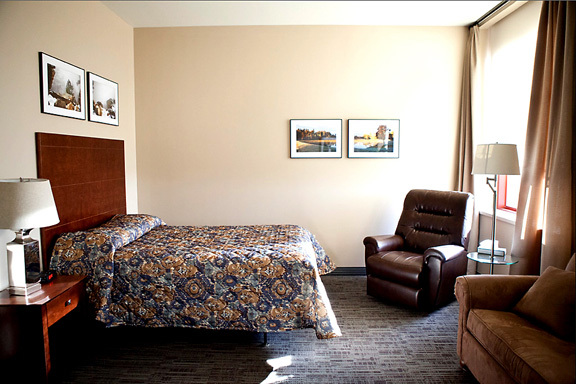 These renovated guest rooms were dedicated on March 7, 2015. 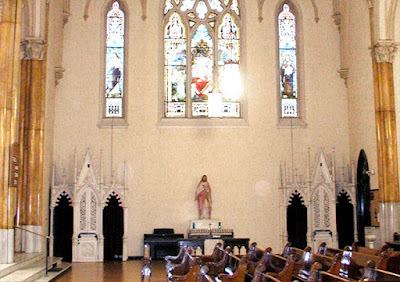 ABOVE: Before our renovation. 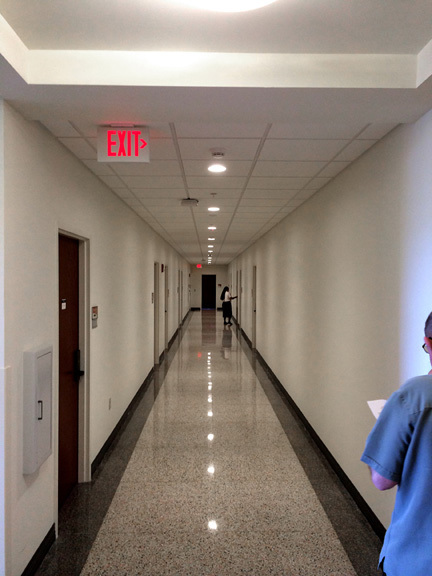 A typical hallway in Bede Hall had white walls, dropped in ceiling, stark white LED lighting and terrazzo floor. 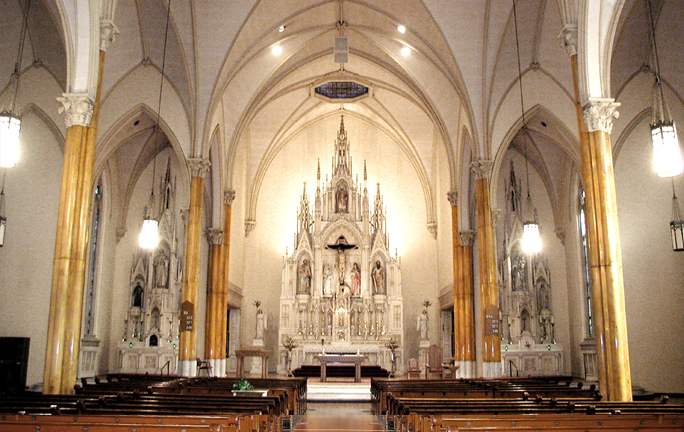 BELOW: After the renovation. A wood chair rail breaks up the wall with deep beige below and light beige above. 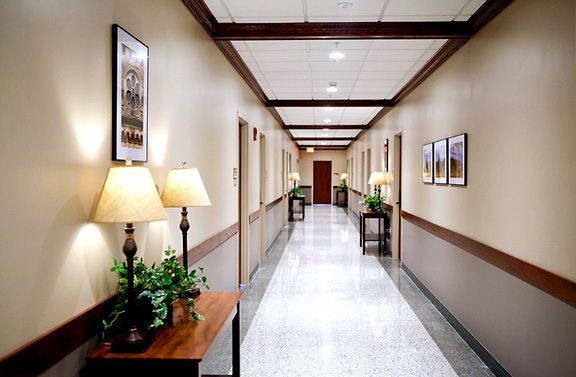 Wood crown molding and cross beams are used to break up the ceiling and make the hallway seem less cavernous and long. It also helps to make the dropped-in ceiling look less conspicuous. Library tables with lamps, plants and art also break up the space and give it some life. 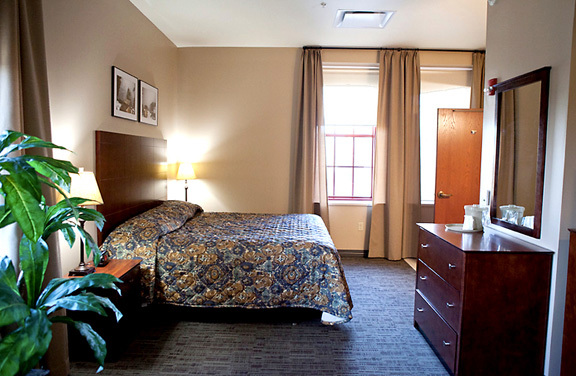 BELOW: typical guestrooms before our renovation. The guest rooms were, to put it simply, spartan - white walls, twin beds, a pull-out sleeper, a small desk and a crucifix on the wall. Room furniture was maximized for occupancy when used for youth programs - a 10 x 12 space that could sleep three. 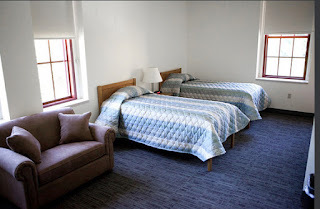 BELOW: Two of the renovated rooms. The guest rooms now have a queen size bed with a headboard, window drapes, a comfortable lounge chair, a TV and small fridge chest, a desk and desk chair, a chest of drawers, several lamps and art for the walls. Walls are painted in a warm beige with a darker accent wall. her daughter, Anne, their first tour. To say they were delighted, would be to put it mildly. Her dedication speech is available here. Say to those whose hearts are frightened: Be strong! Fear not! I have spoken these words from Isaiah the prophet to myself for most of my life because fear has had a tendency to be a ruling force throughout. Battling fear is still part of my everyday life! The world can be a scary place sometimes. The words of Isaiah are, for that reason, words we all need to take to hear and reflect on in a serious way. It still happens after all these years. I get on a plane by myself heading out to some far-flung diocese to face hundreds of priests and realize that I am overcome with fear and doubt – fear of rejection and doubt about my capabilities. Even though I haven’t had a disaster yet, on the contrary appreciative acceptance, I have to talk myself up and my demons down every time I take off on another speaking trip. I can still remember being paralyzed by that same fear and doubt before opening the box my first published book arrived in – fear of rejection and doubt about my ability. The secret to true personal freedom is the ability to face our fears, to stand up to our own cowardice and to do hard things for our own good. What I have learned from years of doing those things is that you end up amazed at the great things that will come to you, if you do! Another thing I have learned is that it takes an amazing amount of concentration of the will to overcome the embedded negative messages we carry from childhood The good news is that with dedicated practice it is indeed possible to silence those messages somewhat and rob them of some of their power. I believe I am where I am today, able to do what I do, because of my determination to not allow fear and doubt to control me. I am very happy that, with God's help and my willingness to keep trying, I was able to overpower my own crippling messages! The third thing I have learned is that there is wisdom out there that is available to us about overcoming fear and self-doubt that others can share with us. As you know, I collect motivational quotes and I regularly share some of my favorites on this subject in hopes that you can learn from them as well. Fear probably defeats more people than any other one thing in the world. I once read that F-E-A-R stands for “fantasy events appearing real.” I read somewhere else that, statistically, about 90% of the things we worry about never happen. Jesus was so right when he said, "fear is useless, what is needed is trust." How we handle fear determines whether we experience adventure or whether we are limited by the fear of it. Without scary, we don’t get to be brave! I would say that my life has been enriched every time I have gotten up the guts to look fear in the face and say “No, you are not going to run my life! I may fail, I may get hurt, I may be laughed at, but again I might not, so once and for all, be gone!” I had to stand down fear when I left home to go to the seminary at fourteen.I had to wrestle fear all throughout seminary so that I could stay in. I refused to be ruled by fear when I decided to be ordained, when I got my first, second, third, fourth, fifth and sixth assignment. I have had to deal with fear when I decided to retire and, because I refuse to stop growing and changing, I still have to deal with it as I welcome new challenges. I deal with it by saying "no" to it in the most firm voice I can! "What do you mean, I can't do it? Watch me!" Students! The words of Isaiah today are spoke to you as well! ‘Be strong! Fear not!” Do not listen to the discounting voices of those who do not believe in you! Do not listen to that discounting voice in your own head that does not believe in you! Tell them both to shut up! Listen instead to God’s voice in your own heart – that tiny whispering voice that gets drowned out by the discounting noise of the world and that discounting noise that goes on in your own head. God's voice is telling you not to fear, to be strong and to know that "yes you can because I am with you!" Take it from one who has been there! God has great plans for you! He wants to take you to places who cannot even imagine for yourself! Do not let fear hold you back, wherever its source, from becoming who you really are and who you can become - your true self! Henry Ford may have said it best when he said, “Those who think they can and those who think they can’t are both right!